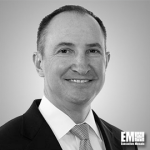 Daniel Jablonsky, formerly president of Maxar Technologies’ (NYSE: MAXR) DigitalGlobe subsidiary, has been named president and CEO of the parent company. Jablonsky succeeds Howard Lance, who has stepped down from his roles at Maxar, the company said Monday. “Dan’s experience as president of DigitalGlobe, after previously serving as both general counsel and general manager of the U.S. and international defense and intelligence businesses, and participation in Maxar’s executive leadership, provides him with a deep understanding of Maxar’s businesses, operations and strategy,” said Howell Estes, board chairman at Maxar and a retired U.S. Air Force general. Jablonsky assumed the role of president at DigitalGlobe in October 2017 after Maxar completed its purchase of the commercial satellite imagery services provider. He has been on the board of Vricon – a joint venture of DigitalGlobe and Saab – since 2015. He previously worked as a partner at law firm Brownstein, Hyatt, Farber, Schreck; corporate counsel at Flextronics International; and as an attorney at O’Melveny and Myers and at the Securities and Exchange Commission’s division of enforcement. Jablonsky started his career in the U.S. Navy as a surface warfare officer and nuclear engineer. His appointment came just weeks after Maxar completed its U.S. domestication process.